Anthony is odd. Rosemary is stubborn. They're both about 40 and have never married. They each live with their parents on neighboring farms in present-day Ireland. The two have known each other all their lives, and they don't know enough about themselves to recognize what they want from life, or from each other. But they talk of it. In John Patrick Shanley's Outside Mullingar, currently running in the Dorset Theatre Festival, talk rises like mist, obscuring the way while beckoning forward. While Hollywood reduces romance to adding one plus one with some cute misunderstandings, the romance in this rural setting and in the hangdog fatalism of the characters is a good deal subtler and more insightful. Shanley won an Oscar for scripting the 1987 film Moonstruck and a Pulitzer Prize and Tony Award for his 2004 play Doubt: A Parable. 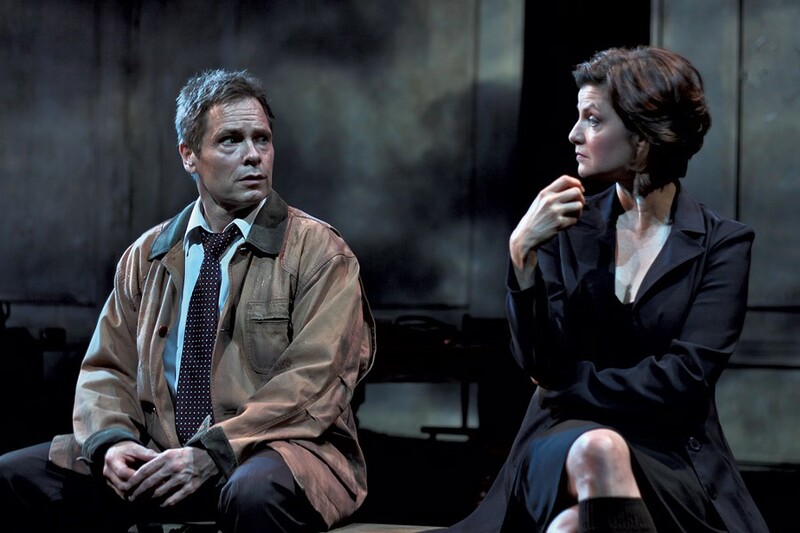 Last year, Outside Mullingar earned a Tony nomination for best play. Shanley's dialogue in this play may be full of insults, complaints and threats, but because it's spoken by his Irish creations, wit and humor blot out the spite. The play is funny even at its darkest and explores both the sweetness and sourness of an obstinate hold on land, family or love. The play begins with a death, and with Anthony and Rosemary down to a single parent each. Rosemary's mother, Aoife, has buried her husband and sits in matter-of-fact mourning, chatting with Anthony and his father, Tony. Shanley has fashioned a neatly structured play that nevertheless appears to meander as aimlessly and unpredictably as a river. It's pure conversation, filled with surprise and wit, and the plot unspools effortlessly, covering five years in several scenes. Through simple events, Shanley gives his characters' inner lives external expression. A piece of land has been sold from one farm to the other, and one neighbor still wants what the other won't sell. Tony is considering leaving his farm to his American nephew instead of to his son. Rosemary smokes; her mother says she "doesn't like to do it in front of me, so we don't see much of each other." Everyone is at a standstill, and it's not a happy equilibrium. The characters will solve that problem by talking, or by dying. On his deathbed, Tony finally speaks with love to his son in a scene of enormous tenderness grounded in plainspoken truth. After Rosemary's mother dies, she and Anthony become solitary neighbors, bickering and chatting for years — long enough to tell their secrets and finally their hopes. At Dorset Playhouse, director John Gould Rubin has made the most of four exceptional actors. Rubin consistently brings scenes to an emotional peak without ever signaling that a climb is under way. It's like coming to the crest of a hill and seeing a sudden vista. Mary Bacon, as Rosemary, has a mesmerizing way of bottling and releasing energy. Whatever she's holding back is tantalizing; whatever she's dishing out is stunning. She has the courage to play Rosemary as a bit shrill, ready to put off anyone. Bacon occasionally crosses into exaggeration, making frenetic moves to amplify what's already loud enough, but she always intrigues. From the tousle of his hair to the frustration in his clomping stride, Michael Hayden embodies Anthony's fierce but flawed grip on life. Stymied by his father and socially clumsy, he has only his farmer's strength to help him. Hayden captures the character's unsophisticated speech and impresses by wholeheartedly inhabiting Anthony's tenderness, and his oddness. As Tony, Jonathan Hogan makes a cold and cranky father fascinating. He ought to be infuriating, but Hogan's conviction and knack for turning an insult into a revelation are enchanting. He moves with imperial shabbiness — tall and rumpled, powerful and languorous. In a scene in which father and son finally connect, Shanley gets the credit for having the courage to write about a father's love, but it's Hogan's performance that earns the tears. In her role as Aoife, Jennifer Harmon establishes a fine rhythm with Hogan. The two characters battle steadily, but Harmon shows Aoife mercurially deciding what Tony can and cannot get away with. He cuts her off, she stays engaged, and on they go, brightly trading verbal blows. The production design, with scenery by Narelle Sissons, lighting by Michael Giannitti and sound by Ryan Rumery, is imaginative to the point of risk taking. For this reviewer, every element works, but theatergoers expecting a set like a romantic Irish travel poster, with plenty of antimacassars and teacups, will be disappointed. Rubin and the design team have gone a bold and different way. The set is a big rectangle, with 14-foot walls relieved by architectural molding and a single utilitarian window. While the very size makes it bleak, the water stains on the walls and a floor covered in what appears to be dirt give it startling dereliction. A woodstove leans on crooked legs. Buckets stand about, some with bits of plant matter drooping from them. A milking stool is mashed into the dirt, askew. Are we outside or inside? In a barn, a kitchen or a field? The answer seems to be all three. In addition to a physical space that is magically large and incomplete, the production uses subtle projections on those massive walls. Projections designer Kevin Ramser chose rain, clouds, a flickering candle and spring grass to underscore the emotion and circumstances in each scene. The lighting complements the effects, with delicate changes that mimic the breaks of sun in and out of clouds or the warmth of a single light in the darkness. Rumery's sound effects extend the illusion, as rain or birdsong marks place and the passage of time. For all the rain that falls and mist that rises, Outside Mullingar is about joy. Cantankerous Tony complains that his son doesn't find joy in the fields, but he seems to have little of his own until he reveals where happiness fits into a life of miseries. Rosemary and Anthony are close to missing that discovery. Watch them hunt for it in this great production of a fine play. The original print version of this article was headlined "Irish Ayes"